The 2017 installment of the FYF Fest is making big moves in 2017. In addition to expanding to a three-day format, organizers have announced a number of new acts to the already stacked lineup for this year’s expanded event. The festival will be held at Exposition Park in Los Angeles July 21 – 23. 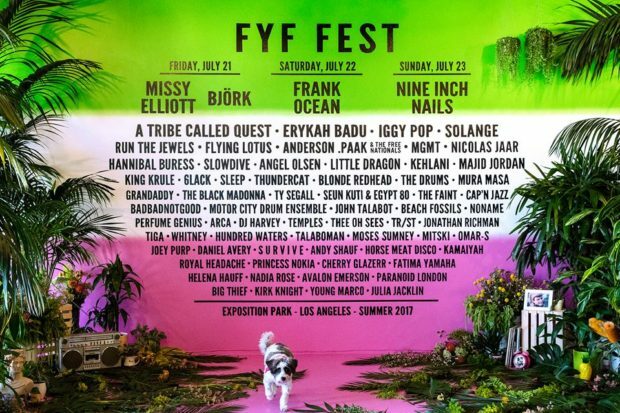 The diverse FYF Fest ’17 lineup includes Nine Inch Nails, Missy Elliott, Frank Ocean, Björk, A Tribe Called Quest and Iggy Pop have been tapped to headline. Solange, Run The Jewels, Anderson .Paak & The Free NAtionals, MGMT, Hannibal Buress, Thundercat, Ty Segall and Jonathan Richma. The Los Angeles music festival always brings one of the more impressive cross-genre lineups on the summer-festival scene, and right now, it looks like they have one of the most top-to-bottom stacked bills of this summer. Head over to FYF’s site for tickets and more info about the incredible event!